Grab a paddle and take a new look at the Big D.
Kayaking is surging in popularity in metro Detroit, thanks to cleaner water, municipal infrastructure improvements, kayak rentals, guided tours and affordable watercraft. Tiffany and her husband, Patrick, saw the beauty – and potential – of the Detroit River and opened their retail store 12 years ago. But it is their kayak rentals and tours that have grown dramatically. The VanDeHeys in 2015 expanded their business to Belle Isle Park, where their RKC Adventures offers tours and rental kayaks, canoes, bikes and paddleboards from the Flynn Memorial Pavilion on the southwest side of the island. 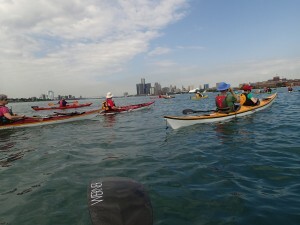 “The canals on Belle Isle are a great place to kayak. 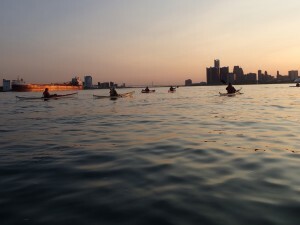 The water is a little bit easier to paddle, but you still can see the skyline of Detroit, the Ren Cen and freighters going up and down the Detroit River,” VanDeHey said. On any warm day, you’ll see millennials, baby boomers and families plying Detroit-area rivers and lakes in their brightly colored kayaks. Rivers such as the Detroit and Rouge have a long history of industrial use and ensuing environmental fallout. Although still designated an “area of concern” by the U.S. Environmental Protection Agency, even environmentalists agree they’ve come a long way in the recent decades. Dramatic pollution prevention, cleanup and conservation have made the area one of the most impressive environmental recoveries in North America. “The efforts to improve the Detroit River’s water quality are a shining example of the types of wildlife conservation and management that will ensure the state’s forests, waters and wildlife are protected and preserved for generations to come,” said Henry Stancato of the Michigan Wildlife Council, which recently launched a public education campaign highlighting the importance of managing the state’s natural resources. Public and private agencies for decades have worked to clean and protect the region to foster the health and diversity of wildlife, fish and plant resources. “All the hard work that’s taken place and continues today allows a better quality of life for activities such as hunting, fishing, wildlife observation and environmental education,” Stancato said. Knowing the importance of preserving and embracing our water resources, Michigan legislators in 2014 approved the Michigan Water Trail Program, and a website was created to steer kayakers, canoeists and non-motorized boaters to launches along various waterways. Similar to bicycle or snowmobile trails, they often include signage for access and portage points, as well as information on local heritage, businesses and attractions. Belle Isle/Detroit: This segment travels around historic Belle Isle, providing great views of the island (including the historic Detroit Yacht Club), the Detroit skyline and Canada. This seven-mile stretch also provides a great opportunity to observe freighters from the water. Lower Detroit River: This portion begins in Wyandotte’s Bishop Park (which features and adaptive kayak launch) and travels about 10 miles south to Lake Erie. 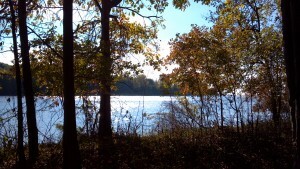 The trail passes by many downriver features, including the Detroit River International Wildlife Refuge. Rouge River: This segment begins in the city of Melvindale and travels about six miles up the Rouge River. Just beyond the scenic coastline lies one of the largest industrial complexes in Michigan, including the Ford Rouge Complex and Zug Island. Paddlers on the Rouge River are often surprised by the great blue herons and kingfishers that frequent the area. Huron River: This trail begins in the city of Flatrock and travels about 10 miles to Lake Erie. Quite scenic, it meanders through several small bedroom communities. The Detroit River International Wildlife Refuge is just 20 miles south of Detroit along the lower Detroit River and western shoreline of Lake Erie. North America’s only international wildlife refuge, its nearly 6,000 acres include 20 scattered “units” of islands, coastal wetlands, marshes, shoals and waterfront lands. The refuge is actively managed to support an abundance of wildlife, said manager John Hartig. “This showcases how an urban refuge can work hand-in-hand and be there for wildlife as well as for the people who live in the area,” said Joann Van Aken, executive director of the International Wildlife Refuge Alliance.